Thrifty White is an employee-owned regional pharmacy chain with 86 corporate locations in six states, in addition to affiliations held with independent pharmacies. As of 2017, Bismarck was home to three Thrifty White Drug locations while Mandan was home to one. Its long-time downtown Bismarck store is located on the first floor of the Parkade and also houses The White House Cafeteria. 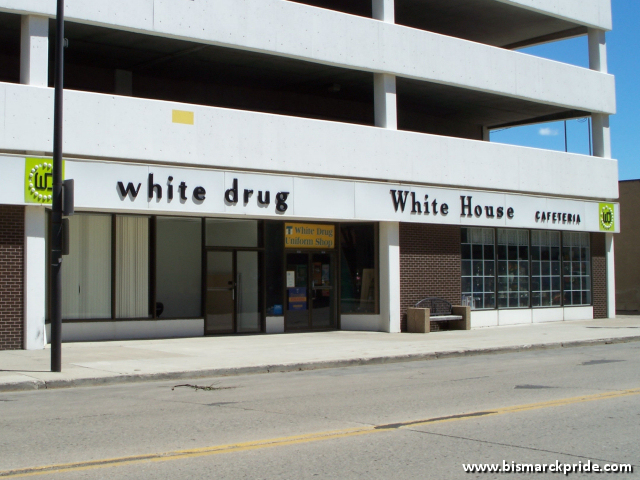 Founded in 1884 as White Drug in Jamestown, North Dakota, Thrifty White is a result of a merger between White Drug and Thrifty Drug of Brainerd, Minnesota in 1985. The company operates under the White Drug and Thrifty White banners and any variation of the combined names. The Mandan store recently announced plans to relocate from downtown to the north side of the city, near the new Walmart. In 2015, long-time pharmacy retailer Northbrook Drug became Thrifty White Pharmacy. The pharmacy at Cash Wise Foods has also since converted to Thrifty White. Thrifty White also once operated a small chain of ten discount department stores across the Dakotas and Minnesota under the White Mart banner. The first White Mart opened in 1970 in Devil’s Lake, North Dakota. Both stores were collectively referred to as “White’s”. The discount arm was slowly faded out after the merger to concentrate on the company’s core drugstore operation, with the final locations closing in the early 1990s. The Bismarck White Mart was an original anchor store for Gateway Mall when it opened in 1979 (White Mart itself didn’t open until February 1980), but closed in 1986, citing costs involved in converting the location to embrace the company’s new emphasis pharmacy operations.